Allowing your team to work remotely could cut a big cost from your business. And it widens the talent pool available to you. You can hire someone located anywhere in the world. Two people I admire most in business were John D. Rockefeller and Sam Walton. Not for everything they did, but for many things. One of those things, a thing these two shared, was a crazy drive to cut costs anywhere possible. Standard Oil slashed the price to bring light to people during nighttime. Imagine walking into your house and needing whale oil to get even a flicker of light. Standard’s kerosene changed the world. It started as somewhat of a luxury, but the company was driven to find efficiencies and cut the cost so that just about anyone in the world could buy it. They sold it to the poorest of people all over the world. And the story of Walmart is more modern and more well known. Sam was incredibly driven to find value. He was always looking for ways to cut costs so that he could bring more goods to more people. Anyway, I think it’s a great trait to obsess over if you’re an entrepreneur. And with modern technology cutting out an office can be a great way to cut costs. A mortgage, which includes taxes, upkeep, interest, etc. or rent, which includes all those other items and a little more can be expensive. If you’ve found a way to minimize those costs then that’s great. 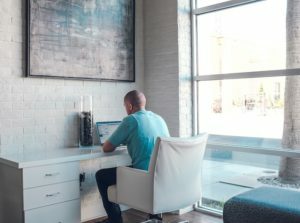 If not, and if you’re looking to run a small business without an office, here are some tips. The first area you have to watch without an office is your team. Your human resources. The first step to managing people, especially remotely, is identifying your own core values. Since you’re a small business these will either be your own core values or they’ll be the owner’s core values. Hopefully if you are managing for an owner you share the same core values of the owner. There is not a right or wrong answer when it comes to core values. You can’t fake. It’s just the way you live your life. The one, two or maybe three things that are most important to you. You identify these. You don’t create them. You want to hire people that share these core values. At least as much as you can. They don’t have to be your clones, but you want them to at least share your core values. Because they’ll be easier to manage. You won’t have to micromanage. You’ll be able to trust what they’re doing because they have the same guiding compass that you have. Next comes operations. All the inner workers of your business. How you take resources and create a product or service that you sell to your customers or clients. When it comes to running your company without an office you’ll have to choose the right tools and focus on communication. There are tons of tools that allow you and your team to work together. “The Cloud” is thrown around. Really it means that you can your team can access the same documents and information from anywhere. And you can access the latest versions and all work on the same version. That’s basically it when it comes to small business. It’s really what allows teams to work together remotely. Anyway, I like to keep it simple when it comes to tools. I use the G Suite from Google. I haven’t found an easier way to manage a small business without an office. It’s cheap. It’s fast. It’s reliable. And I’ve tried a lot of product management software offerings and all that stuff, but email seems to still be the preferred method for communicating. So does text. Voice memos are getting a little more popular. Don’t overcomplicate it when it comes to your tools. Collaborating tools, accounting tools, sales tools, etc. The final big one is sales. It’s more important if you sell in your office now or if you think your customers care that you have an office or not. You might have to change your offering. If you sell to people that need you to have an office or if your product or service somehow requires you to have an office the only way it’s going to work is if you change the offering. You might also need to look at the sales process. Instead of making it part of the process to bring people into the office you just remove that step. It might be that easy. One last thing is if you’re manufacturing something you may need to have a central location. But maybe the office staff could still work remotely. From their homes. Saving on a commute. Saving on rent and the expenses of an office. But the key to it all if you’re thinking of making this move is to focus on the tips above. Those have been the big areas. It’s a continuous process. I’m still working on it and I’ve been running a remote business for 8+ years. But the payoff can be worth it. You can cut costs and undercut your competition that has to pay for an office and build it into their price.